Nokia has been busy pushing out software updates - a second one for the Nokia N900, one for the Nokia 5800 XpressMusic and one for the Nokia Software Updater. After the minor update, which brought Ovi Store functionality to the N900, the second update in a row brings a bigger set of improvements, while the Nokia 5800 finally got what should have been there in the first place - kinetic scrolling. The first update for the Nokia N900 earlier this week, opened the doors of the Maemo 5 section of the Ovi Store and prepared the application manager for software updates. If you have installed that update, you should get a new notification now for the second update. 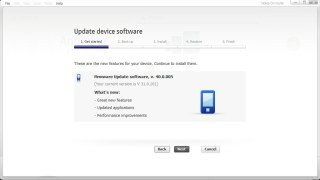 If you prefer to update your Nokia N900 through the Software Updater using a cable and a computer, then you can update to this latest version even if you haven't installed the previous minor update. The update should be available to all users within 24 hours. It didn't bring portrait mode for the entire interface, which is one of the most anticipated updates, but at least we hope Nokia will keep up the pace and will not not let the Nokia N900 software get out of date. Here's the full changelog for more details. Speaking of dated UI software, the Nokia 5800 XpressMusic just got an update as well. The new firmware brings it up to speed with the Nokia 5530 XpressMusic and the Nokia 5230. We installed the update and poked around to see what's new as there's no official changelog yet. The most noticeable change is the homescreen - the Contacts bar as we've seen it on the Nokia 5530 and the 5230 is now available on the Nokia 5800 XpressMusic. This means instead of just four contacts you can put a lot more and they are side scrollable. There are also four applications shortcuts at the bottom. The Nokia 5800 XpressMusic also finally got the long awaited kinetic scrolling too - it works throughout the whole UI (except in the main menu). It goes really fast too - a single fast sweep now scrolls a lot more than it used to on, say, the Nokia 5530. Another simple but very welcome usability update is that tilting the phone sideways while typing text automatically switches to the landscape QWERTY - no more landscape 3x9 keypad nonsense. Other changes concern the incoming call screen and the ringing alarm screen (when the phone is locked) – now they feature two sliders. For the incoming call they work as Accept and Reject and for the alarm – as Snooze and Stop. The Nokia 5800 update is not available over-the-air just yet, so if you've got your hands itching to get it, you have to update your Nokia 5800 XpressMusic using a computer and the Nokia Software Updater application. And finally, in this long line of Nokia software updates, there's an update for the Nokia Software Updater application itself. It's in the Release Candidate stage, but it should come out in its final glory in a few weeks. 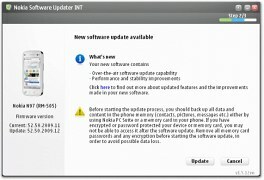 The novelty is that the new version of the Software Updater now works under Windows 7 and establishing USB connections with it is more robust.